The Jim Markum Swing Band is a 11-piece group that features very talented musicians on every part. Though small by "big band" standards, this band packs a HUGE punch! From screamin' brass to wailin' saxes, jammin' rhythms to drippin' ballads, this band has it all. Featuring Jim Markum on lead trumpet, their signature sound includes screamin' high notes and techinal prowess other bands can only dream about. 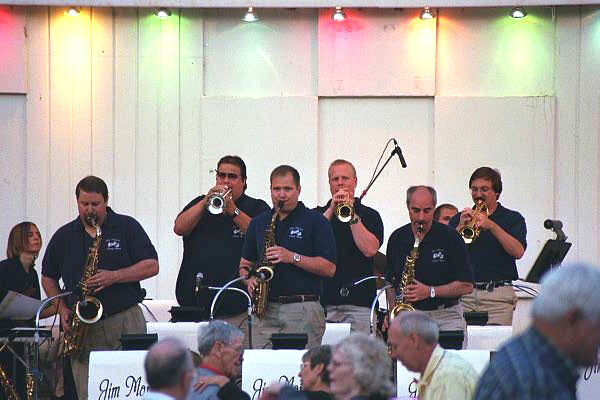 From golden oldies of the Big Band Era to the modern sounds of pop, jump swing, and blues, the Jim Markum Swing Band will get you "IN THE MOOD". Our growing library contains a wide variety of music suitable for any occasion and audiences of all ages.